When Leslie Basalla started working at Market Garden Brewery in Cleveland’s Ohio City neighborhood, it had no organized tour program. When someone requested a behind-the-scenes look at the brewhouse, staff would grab whoever was available at the time to show them around. Because of her beer knowledge, more often than not, that person wasBasalla. She initially volunteered because she loved talking and learning about beer and, as she puts it, “I’m good at talking loudly to groups of people.” It wasn’t long before she saw a potential business opportunity. One of the tour groups that frequented the brewery was Cleveland Brew Bus, then operated by founders Bob and Shelle Campbell. Seeing a fast-growing tour operation, Basalla approached them about a job and ended up buying the business. Cleveland Brew Bus, which sells organized tours of breweries throughout Northeast Ohio focused on beer education, is now thriving, Basalla says. With new breweries popping up all over town, craft beer gaining market share and tourism on the rise in Cleveland, she maintains that it’s a good time to operate a brewery tour business and that there’s room for growth. “Our tours tend to book out, especially on the weekends, months in advance,” says Basalla, who operates the business with her boyfriend, Brian McCafferty, a firefighter who has a commercial bus driver’s license. The tours cost $55.50 per person, last five hours and include four sample-size tastes of beer at each brewery, along with a pretzel necklace and a souvenir pint glass. “We’ll do up to five tours per weekend over the summer,” Basalla says. The Brew Bus’s growth is a product not only of rising interest in craft beer, but also the rapidly growing number of breweries in the area. When Basalla started working with Cleveland Brew Bus, it toured eight breweries in Northeast Ohio. Today, the firm has relationships with 18 and is now organizing package tours of regional clusters of beer halls across the metro area. Cleveland Brew Bus is part of a rising trend toward beer-fueled tourism. Cities like Portland, Oregon, have multiple brewery tour companies, and Cleveland is now catching on. Northeast Ohio tourism groups are taking notice, as well. 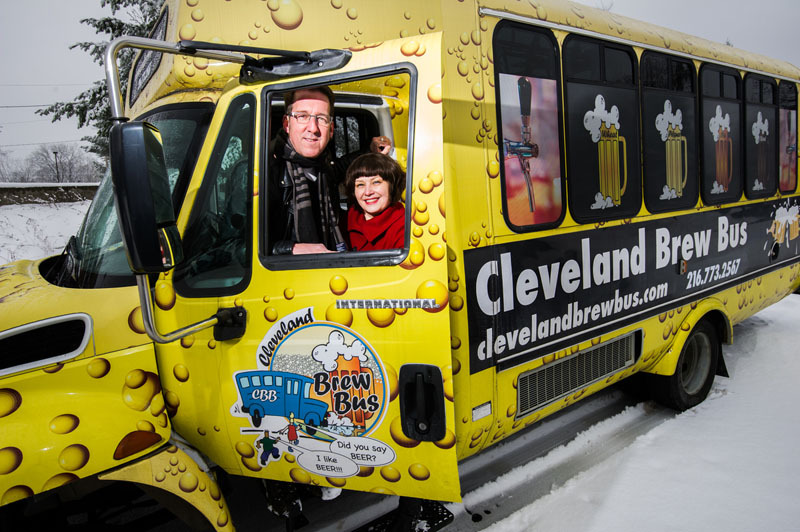 Destination Cleveland, the area’s tourism and marketing organization, is promoting the Cleveland Brew Bus in an upcoming dining guide, Basalla says. She is also working with her Ohio counterparts, Columbus Brew Adventures and Cincy Brew Bus, to promote Ohio as a good place for craft beer enthusiasts to plan a trip to. Cleveland breweries are also capitalizing on the trend by creating more organized tour programs. The fledgling Platform Beer Co. in Ohio City now has a designated staff person and program when it is contacted for a tour, while larger entities like Fathead’s Brewery & Saloon and Great Lakes Brewing Co. offer their own public tours with regular hours. Market Garden Brewery jumped on the bandwagon, too. The company is opening perhaps the most unusual brewery tour in the area later this year at the so-called Palace of Fermentation, a 23,000-square-foot brewery and food production facility. Tourists will enter through a glassy two-story foyer into a retail area, where they’ll have a chance to hop on a free tour. It will include a close-up look at the company’s brewing operation—via a second-level catwalk that will allow visitors to peer into the tanks and watch the brewing process. “In the restaurant business, it’s open kitchens, where the theater of food production is celebrated,” said Sam McNulty, one of the partners behind Market Garden. “Mixology has really flourished in large part because you see the process happening behind the bar, and it’s a lot of fun to watch. Beer is no exception—to smell the barley and the hops, to watch the process while holding a glass of fresh local beer in your hand, there’s nothing like it. With Cleveland’s venerable West Side Market next door and Cleveland’s only hostel down the road, McNulty is expecting visitors from all over the world flowing through his doors. Cleveland’s largest brewery, Great Lakes, is also ramping up its tour business. 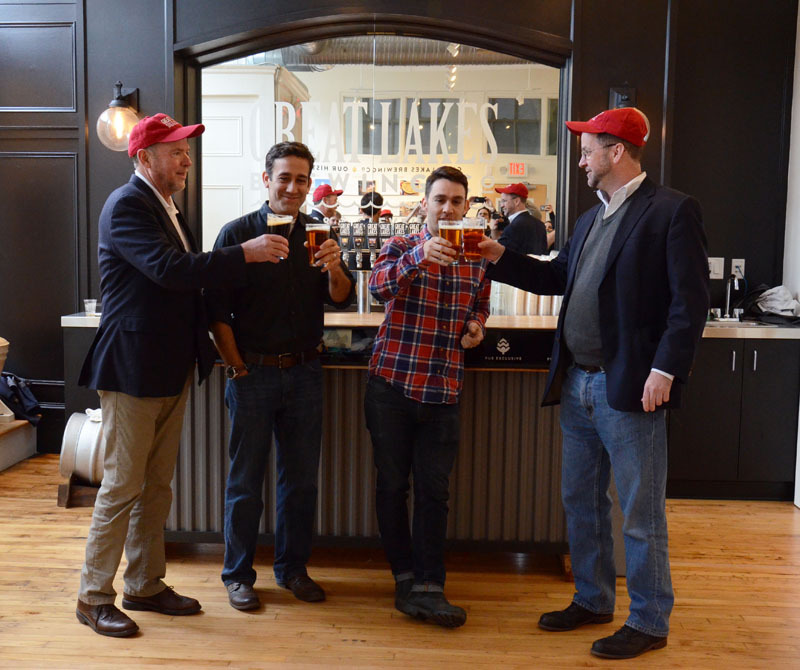 The 27-year-old company, whose production now exceeds 150,000 barrels a year and is the 23rd-largest brewery in the U.S., just opened the Beer Symposium, a sleek new visitor center adjacent to its Ohio City headquarters. Great Lakes executives believe that the visitor center will help the company to better tell its story while also serving as a launching point for the new tour program, which will cost $5 and include several beer tastings along the way. Cleveland Brew Bus isn’t the only brewery tour company popping up in Northeast Ohio. 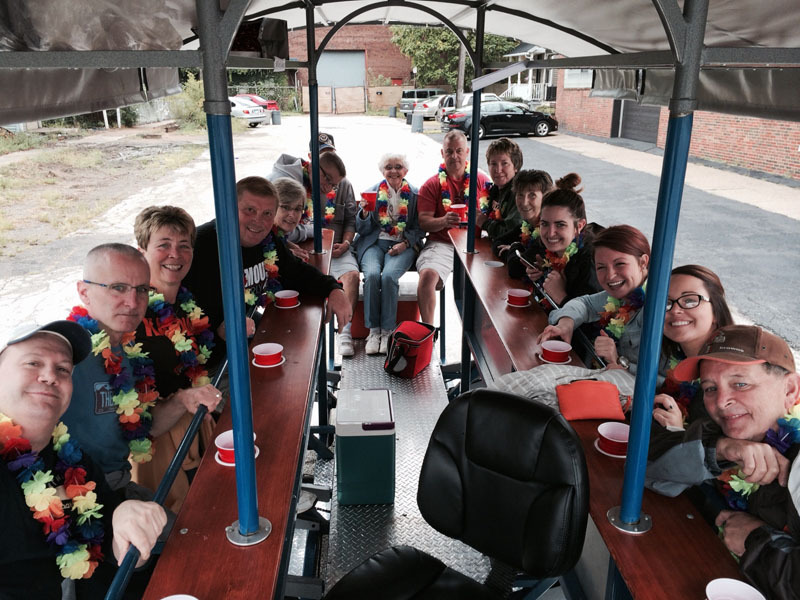 Cleveland Cycle Tours, which offers a 15-person bike tour on a giant group bike, takes participants on tours of either Ohio City or Tremont to pubs and breweries. The company is in the process of purchasing a second bike to keep up with growing demand. While quaffing a brewer’s latest creation is certainly a key part of the appeal, Basalla and others say beer tourists are also genuinely curious about how the beer is made and how different styles taste. Cleveland Brew Bus will arrange custom pickups for participants in order to ensure safe driving, and the company always allows time within the tour for people to order and share a meal. This article appears in the World Beer Festival-Cleveland Beer Guide. The festival is produced by All About Beer Magazine.